With 7 weeks to go in the season, it's still a little early for award predicting. But Geoff Baker had to write something for The Seattle Times and I suppose I need to write something here. Baker believes Hernandez, despite his 8-10 record, can make a legitimate run because he's in the top 5 in Innings (1st), ERA (4th), Strikeouts (2nd) and Complete Games (2nd). Then Baker blows my mind talking about King Felix being in the top 5 of FIP and xFIP. Geoff Baker, you had me at FIP. 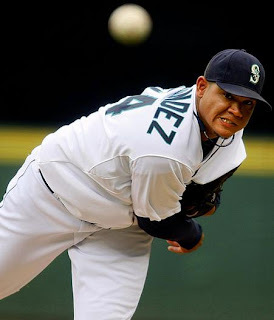 Felix Hernandez is having another great CY Young type season that I guess I didn't even really notice because he is a Mariner. So, I guess it's about time for me to take a quick look at my fictional Cy Young ballot. The ballot has been expanded to 5 spots from 3 spots for what might as well be called the Keith Law Law. For my imaginary ballot, I'll be ignoring wins (sorry Carl Pavano) because just stop it already. Lee has been downright masterful with his command of the strike zone. His 15.22 K/BB ratio would not only shatter Brett Saberhagan's 11.00 ratio from 1994 but make Jered Weaver look like a jerk with his second best 4.44 this year. Lee (3.25) has the second best xFIP in the AL and has the most complete games in the league with 7. He also has the best WAR (6.0) and WPA (3.72) in the AL. After Lee, the rest of the best are a pretty tight group but King Felix is as deserving as any. The innings and strikeouts are impressive but Baker didn't mention that Hernandez is also tied for 5th in hits. His .294 BABIP suggests he hasn't really been unlucky in that area either. He's 4th in xFIP (3.36) but only .11 points off from Cliff Lee. He's also 3rd in WAR (4.8) and 4th in WPA (2.80) in the AL. The 10 or 11 wins he'll end up with will certainly hurt him though. It's unfortunate for him that your sister scores more every year than the Mariners. Weaver is flying under the radar despite leading the AL in strikeouts. He was placed in the ace role for the Halos after Lackey departed and has certainly lived up to it. He's 5th in xFIP (3.38) and 2nd in K/BB (4.44). He's 5th in WAR (4.4) at Fangraphs or tied for 1st with Lee (4.7) at B-R. I should note that I use Fangraphs for most of my stats unless Baseball-Reference helps my argument better. He's also 2nd in WPA (3.34) in the AL. If he can get up to 15-16 wins from the 11 he's sitting at, he might have a good chance at running up Cliff Lee. Unless Pavano gets to 20 wins, then all bets are off. Lester has the most wins (13) on my ballot. His BB/9 ratio is up this year from his previous 2 years which is keeping him from being in the top 5 in K/BB but he is 3rd in the AL in strikeouts (165). He's 3rd in xFIP (3.26) just .01 away from Cliff Lee. Lester is 4th in WAR (4.6) and 3rd in WPA (3.24). Considering his wins and market, he'll probably end up finishing much higher than 4th. Liriano isn't close to the top 10 in innings pitched but he's been exceptional when he's throwing. Despite the fewer innings, he's still 4th in strikeouts (160). He leads the AL in both FIP (2.19) and xFIP (2.94). Liriano is 2nd in WAR (5.6)but only 11th in WPA (2.24). Liriano will probably only sniff the ballot if some of the new more sabermetrically inclined members get some AL Cy Young votes.